As we write, in this month’s (May’s) GQ magazine there’s a nice little nostalgia piece on Eighties protest, complete with quaint little photos of earnest crusties on Poll Tax riots which are no doubt suitable for home framing. Such indications of our own irrelevance might be easier to stomach if we were up to bold new adventures. However Smash Hits, created as a forum for new ideas, has largely the same old saws in it - syndicalism, localism, why we should all join the ACF and even an article by Colin Ward! Okay, so forests of good new ideas aren’t going to spring up overnight. But it does seem indicative of a general tendency for us, not knowing where we’re going, to instead venerate our own past. Even people too young to have ever been at Stop the City or the Brixton riots have been steeped in our lore to the point where they can repeat it by rote. Even actions which were actually total failures, such as the Bash the Rich marches, have been transformed in our memories and added to the collection of cups. Depressed at the low turnout at last night’s meeting? Never mind, let’s tell the one again about the paraplegic guy who got wheeled round the looted supermarket, that always goes down well. Maybe we’re never going to get out of this impasse until we take a cold and dispassionate look at our own roots, and see the early 80s as a set of events arising out of specific conditions and not some golden age where cider flowed, insurgent proles filled every streetcorner and chocolate bars were bigger. One of the ironies about 80s anarchism was that it was created, and probably always defined, by Thatcherism. At the time many in the establishment saw the country as in the grip of militant unionism, as evidenced when the Miners drove the Tories from office in ‘74. One of the workers’ main weapons was full employment, creating labour scarcity and with it the closed shop etc. Determined to break this grip at all costs the new Government decided to re-create unemployment, hoping to strike fear into potential strikers by creating a repository of potential scabs. Moreover, combined with the deep blue sea of unemployment was the devil of a widespread counter-culture (anarcho-punk, free festivals, a large squatting network etc.). And the devil, of course, finds work for idle hands. Many soon found causing trouble was a good cheap way of having fun, that bottling speakers at CND rallies was more of a laugh than having to listen to the boring bastards. Okay, so what was the ideology of these young hooligans? A word of warning here! Nowadays there’s a virtual academic sub-industry devoted to "explaining" social eruptions such as punk. And of course each analyst has his own theory held apart from all the others - after all, that’s how they earn their living. Surrounded by all this there’s a tendency for us to copy capital’s mindset and each have our own cleverly phrased and neatly constructed "explanation" of the thing that anarchism was "really" about. But, like most actual movements, anarchism was a volatile mixture of all sorts of contradictions - populist (antipathy to "fancy words") yet wilfully extremist (fixated with violence beyond any context), puritanical (glorifying poverty) yet hedonistic (into heavy drugs consumption) etc. These contradictions aren’t some barrier which specialist thinkers see through to explain the real essence of the movement to us, they were the essence of the movement. If it had ever transcended them, it would have become something else. But while we can’t reduce anarchism to a coherent set of political ideas it did throw up certain typical attitudes. Adilkno’s ‘Cracking the Movement’ perhaps best sums up the spirit. They write of ‘the Unclassifiables’ who "transformed themselves into ‘activists’, toiling day and night to various ends. ..With radical naiveté they were available for any cause. They’d cook for it in their restaurants, set donation jars on the bars of their coffeeshops, watch the videos, go to all the benefits, come fix a squat up here and there. Everyone was welcome. "Years of constantly living in the present made every argument involving a historical continuity simply a pretty story from which not a single conclusion had to be drawn. Each action stood completely alone, there was nothing to be learnt from it for a future occasion...The strategic thinkers had to reactivate them over and over, to entice them into contributing to the impression ‘that it’s all happening again’. They made up the movement." They’re writing of the Dutch squatter scene, but substitute ‘fleapit pub’ for ‘coffeeshop’ and you won’t go far wrong. Visit either and you d likely find a minority of ‘strategic thinkers’ (usually a few years older and straighter looking) whose job it was to provide tasks for the mohawked mass of do-ers, or ‘activists’. In short we never broke with the organisational forms of the Trots which we so fetishised our hatred of - which of course is the same as that of capital itself. These tasks were picked from a shopping list of oppressions -animal abuse, anti-fascism, squatting etc. Due to the more disparate social/cultural origins of the ‘activists’ this net had to be cast wider than with the Trots, almost any cause could be cause of the week. We’d use this supposed "openness" to try and deny our division into thinkers and do-ers. (The Trots would even comply with us in this myth to paint us as "disorganised" or "single issue"). But this stretching meant an even greater incoherence than the Trots, not only could anything be brought up at meetings, nothing was allowed to be sorted into any ‘hierarchical’ order of priority. This incoherence had to be covered up by giving activism the tempour of religious fervour. Anyone had the ‘right’ to do anything, apart from the great unthinkables of fascism and theory. No-one at any time should be allowed the luxury of sitting down and thinking about what we were doing, in case they confronted us with our own void of thought. Essential to the perpetuation of this was the personalisation of capitalism, which was presented not as an economic system but merely as a bunch of people! Attacks on the working class were seen not as part of capital’s need to restructure itself globally but as coming direct from Thatcher’s personal nastiness. At its best this countered liberal notions of the enemy as some abstract "mode of thought" which floats above society, and led to some who richly deserved it getting gobbed on or roughed up. But at its worst it became some quasi-revolutionary version of 1984’s Hate Week. We became radical hit-men, fantasising about bumping off our shopping list of targets whereupon our shopping list of oppressions would magically disappear. Our critique of political representation didn’t go much further than saying Kinnock was no better a person than Thatcher. (Absurdly, in Smash Hits 2 Andy Anderson is still writing about how "capitalism is nothing more than an economic system originated and developed by middle class people.. this system will end when we expropriate the middle class"). (Worse, anarchism borrowed punk’s fixation with British traditionalism - typical targets were the Royals, "toffs" at Henley, fox hunting etc. Ironically, these archaic elements had by then become a barrier to Britain becoming a modern capitalist power - school tie networks stopping careers being open to ability etc. - and a major part of the restructuring project was removing them. While we bayed witlessly outside their Society Balls it was Thatcher who held the real knives for them. However, especially since this became more blatant with Blairism, this is one mistake most of us know not to make again). Anarchism’s ‘breakthrough’ is usually seen in Class War circles as getting anarchos to support workers in struggle. In part, this is a fair enough point. Many did move from such threats to capital as not eating meat or buying anything on major record labels to physically contesting the State. But the central obstacle this faced was rarely addressed, which was getting a movement subcultural in origin to support what was essentially a foreign culture. Endless arguments about Miners eating meat were never the real issue. The point was that these were the very Mums and Dads you spiked your hair up to piss off in the first place! By supporting them anarchopunks became Anarchists - became genuinely political. However, the divisions inherent in our counter-cultural origins were at best suspended not overcome. Workers might be grateful for the practical support of these funny-looking people, but "they" we remained. At the end of the demo we’d traipse raggedly back to our squats while they returned to their semis. For most anarchism remained a ‘look’ and attitude first, and a set of political ideas second (if at all). Class War itself was a good barometer of this, often announcing it had "left the anarchist movement" in order to become a mainstream working class organisation - only to find the need to "leave" it all over again a short while later. It’s also worth pointing out the distinction between the things we supported (Miners and Printers strikes, inner city riots etc.) and the much smaller events we had direct involvement in (disrupting CND marches, Stop the City, anti Public Order Act etc.). We were responsible for the riots only in the minds of Mirror journalists. 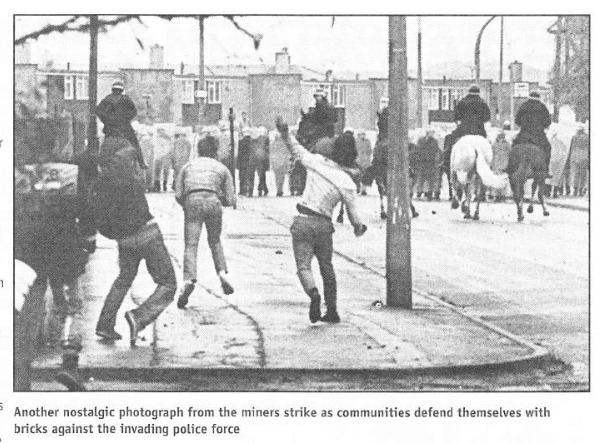 Class War called for the rioters to "open up the second front" in support of the Miners, yet the cities stayed defiantly quiet throughout the strike. Unencumbered by Lefty notions which tried to turn insurgents back into victims we could comprehend the rioters’ motives. But that doesn’t mean they were listening to us in the slightest. By the late Eighties we’d become increasingly marginalised. As Aufheben have pointed out this was due to a combination of the ‘stick’ of dole squeezes (especially the ‘87 Fowler Review) with the carrot’ of new found social affluence (‘Fragmentation of AnarchoPunk’ from ‘Kill or Chill’, Aufheben 4.) Not only were new people not coming into the movement, many were leaving in droves. This led to those that remained clinging to their ideological fixations with greater and greater fervour, even perversely trying to make our marginalisation into a virtue. Actions that had once been intended as examples to others became badges of our difference from "them", that contemptible branded herd who looked straight, paid rent and had jobs. Ultraism became our excuse to become exclusive - which in the long term means you either fade away or fossilise. This in turn created a vicious circle where working people were less and less likely to listen to us. The boom was giving them ownership of their houses and satellite dishes to hang outside of them. Why were they going to listen to a few hate-filled cranks with their bizarre obsessions about "not selling out"? Of course the Nineties are, at least on the surface, the very reverse of this. Workers see bosses raking in greater profits than ever before while their wages fall and the threat of job insecurity grows. Today our enemies are getting away with murder - at times literally. Yet nobody’s doing anything about it! This paradox has led to many orthodox anarchos crying into their beer "but objectively the conditions are right for anarchism!" What is it we’re not seeing? Part of the problem is that anarchists have often had an oddly ambiguous position on assaults on the working class. Many insist that attacks on wages or benefits are "good", even as they campaign against them, because they are "good for revolution". This crudely linear logic is, if anything, Leninist - suggesting working people aren’t going to revolt unless absolutely forced to. Underneath this apparent opposition to ‘reformism’ is a failure to understand history. Job security and benefits were a concession won by previous generations of class struggle, not a clever ruse thought up by the bosses to keep us in line. Recent years have shown us the fallacy that people will revolt when there’s "no alternative". There’s always alternatives, there’s the bottle, there’s all sorts of drugs, there’s domestic and petty violence, there’s a thousand and one ways of hiding your head and not thinking about it. People are likely to explore them all until they start to see practical positive alternatives. Compounded with this is an anarcho fixation with the Left. Trade Unions, single-issue pressure groups, Trots, local democracy etc. - all were seen as enemy agents, defusing revolt. Obviously there’s a lot of truth to this, but becoming fixated with it became very convenient for us. We could happily believe in "the working class", pure and unsullied in their endless antagonism to capital, without worrying why there hadn’t actually been a revolution yet. Oh, that was all the fault of the Left, those sellout swine! In short, we came to put the cart before the horse. But the Left was never an intrinsic part of capital, just one tactic available to it. Nowadays there’s so little revolt to defuse they’re largely redundant. The recuperators aren’t needed on the picket lines so they’ve been shown the dole queue. This has left us pretty high and dry, in some cases even propping up social democracy in order to ritually denounce it! There’s also been attempts to portray our own successors as Leftist recuperators! Reclaim the Streets, Critical Mass and Food Not Bombs are often slated as ‘pacifist’ or ‘single issue’. But RTS, for example, are not bombarding riotous proles with happy house music until they turn into party heads, rather they’re trying to devise ways of getting party heads out from the clubs and onto the streets. Crucially, these groups are trying to recompose around the lower point of struggle they find themselves in. Criticisms of them which ignore this fact are useless, based on a ‘radicalism’ which is bogus and empty. Even supposing they are talking to the wrong people, are we talking to anybody? But overall it’s alienation which is the key to understanding the current context. When people don’t riot or strike it doesn’t necessarily mean they’re happy in their acquiescence, it often means they just don’t see any practical means of opposing it. As the Situationists used to argue every aspect of capitalist society conspires to portray us to ourselves as individuals, as consumers, as order-takers, as anything but active ingredients in history. The only thing to add is that capital’s got a lot more sophisticated about this than when they were first writing about it, and we’ve had nearly twenty years of the (post) Thatcherite cult of ‘individualism’ to contend with. Anti-opencast activists from Selar recently reported a chat they had with some locals: "after a sympathetic conversation one boy, living half a mile from the eviction, said he’d watch the news the next day to catch up on events." (from ‘Autonomy, Media and Representation’, Do or Die 6). From workplace to traffic systems to telly - watch the lights and follow the path. Of course, anarchism was readier than most political movements to encompass ideas about alienation. However, there’s often been a tendency to just add it to the shopping list, or put it on the backburner while we discussed more immediate issues. Partly this is understandable, it is easier to talk about tangible things like the thinness of wage packets or the tedium of work. Unless you’re careful, gabbing about alienation can make you sound like some New Age crank. However, it’s arguable our prime task should be to find practical ways of circumventing this problem. Anarchism never came anywhere near its often stated aim of overthrowing capital, of course. However, while it’s almost impossible to quantify such things, it probably helped slow down the reimposition of austerity upon the British working class. Despite its many weaknesses, it’s worth remembering that had it just been a disempowering waste of time it wouldn’t still be exerting the fascination over us that it does. At our best we grasped, more through intuition than reason, that political liberation doesn’t belong to some distant day called ‘the revolution’, that it’s a process in which we take back control of our own lives from the ‘logic’ of capital and that we can start off that process any time we come together. More hazily we recognised that the true goal of the ‘political activist’ is not to get better at the job or learn to exert more influence - but to negate his/her own role by making such activity so widespread the label loses its meaning. At our worst, of course, we were Leftists without a bath. But such flashes of insight rarely lingered. Eighties anarchism walked a knife-edge, forever slipping one way into pseudo-militant ultraism and another into lifestylist liberalism. It was the view from the brief periods up on that edge that kept you going, even when the troughs became longer and deeper, but the pattern never broke. The movement was ultimately unable to outgrow either its subcultural origins or its own internal limitations and contradictions. Instead, facing hard times, it ossified into a set of rules that had to be kept so rigid because they were actually past their relevance. In the above we’ve largely avoided talking about who’s been indulging in this fetishism of the past. To some degree or another, we’ve all been doing it. Now let’s all cut it out. Paradoxically, defusing its spell means looking hard at the real thing, in its context, in order to salvage from its remains whatever still seems workable for today. We’ve nothing to lose but our scrapbooks! Originally appeared in Smash Hits issue 3, October 1998. (Smash Hits was a discussion bulletin that arose in the aftermath of the fragmentation/'end' of the Class War Federation in 1997). ...we [must] take a cold and dispassionate look at our own roots, and see the early 80s as a set of events arising out of specific conditions and not some golden age where cider flowed, insurgent proles filled every streetcorner and chocolate bars were bigger.